Recorded April 2002 at Workhouse Studios. Engineered by Ian Tompson. Mixed by Deptford Dave at Down Home Studios. Released February 2003 on StayTuned Records. 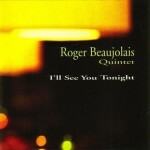 The man turns up playing vibraphone in so many diverse contexts – salsa, acid jazz, R & B, pop – that it makes a nice change to have this CD by the “real” Roger Beaujolais. It reveals him as not only a masterly instrumentalist but a highly imaginative leader, drawing a wonderful range of tones & textures from just 5 instruments. His whole approach is fresh & original without straining for effect. The band itself contains some of the brightest sparks on the contemporary scene – saxophonist Mark Lockheart, pianist Robin Aspland, drummer Winston Clifford & the bassist with the least forgettable name in jazz, Orlando Le Fleming. Le Beaujolais nouveau est arrive, & in contrast to some of his funkier past vintages this is a relatively straightahead affair, medium-bodied & with a clean finish. Beaujolais on vibes is joined in the front line by Mark Lockheart on sax, a cheese’n’grapes combination with great precedents. The rhythm section is typically British & understated, although Robin Aspland on piano loosens his collar on a couple of numbers. This album, mostly originals with Jobim & Joe Henderson thrown in, succeeds in its modest ambitions. Not a grand cru, but enjoyable everyday drinking. “….And here we are over 30 years on with an excellent no-nonsense set from a vibraphone-led band of Mark Lockhart on saxophones, Robin Aspland on piano, Orlando leFleming on double bass and Winston Clifford on drums. The songs are by Beaujolais when they are not by Joe Henderson (Black Narcissus), Antonio Carlos Jobim (Dindi) or Wayne Shorter (Night Dreamer) and the playing is swinging and supple. The harmony lines of vibes and sax are a particular sonic joy and the solos never favour technique over musicality, while the rhythm team pull and push with subtle energy. This is the sound of five men having a ball combining their talents and creativity in the joy of the moment.